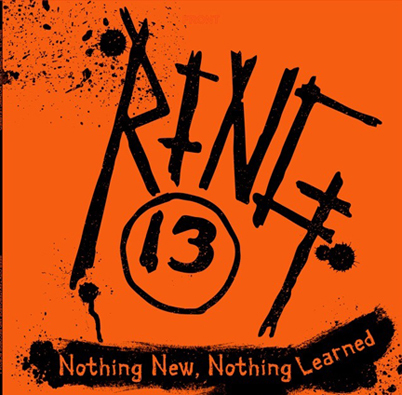 Nothing New Nothing Learned is out on vinyl courtesy of Beer City Records (Milwaukee WI) Dan, Scotty and Bruce recorded 14 songs in 1984 at Sunset Recordings with Mark McLean. As a bonus, 5 songs were added that were recorded in 2013 that we were going to release as a stand alone record but it turned out we were able to release all 19 on one 12". Sadly, we lost Dan to the evil known as cancer in 2015 which was a major sadness for Ring 13 as well as Dan's family. Dan's son Jackson will be joining us for our live shows to support this release in Minneapolis and Chicago which will be an honor for us. Ring 13 would also like to thank Mike Crown and Steve Ross of Subverts fame who filled in for Dan when he went off to college in Nebraska. We'd also like to mention the other two Subverts, Greg Cress and Brian Green who were then, and still are a huge influence on Ring 13. BB And The Guns and Direct Drive (became Articles Of Faith) who originated in DeKalb, we owe credit to as well as seeing them early on helped shape Ring 13's musical direction. Thanks to all the Ring 13 fans who didn't forget about us over the years. You will always be special to us going forward as we plan on recording again someday. If we do, hopefully it won't take another biblical figures lifetime.